Over 800 foods and the amount of Vitamin K they contain, listed alphabetically and also by amount. 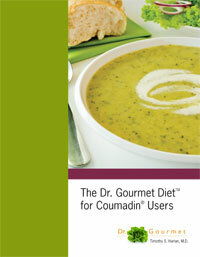 Over 800 foods and the exact amount of Vitamin K they contain in a handy paperback book. 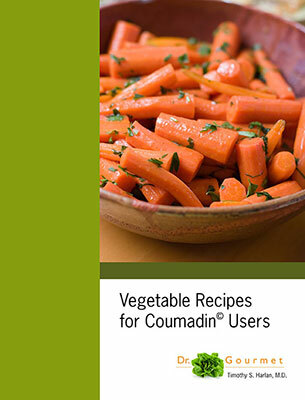 A great reference for those taking Coumadin (warfarin)! If you are a registered user of the Dr. Gourmet Bookstore you can return to the store and download your document again within one week of your purchase. You may download your purchase again up to three times. Please choose your products carefully; all sales are final. This product is in PDF format. To view this document on your computer, you will need Adobe© Acrobat© Reader©. Download the Reader here.